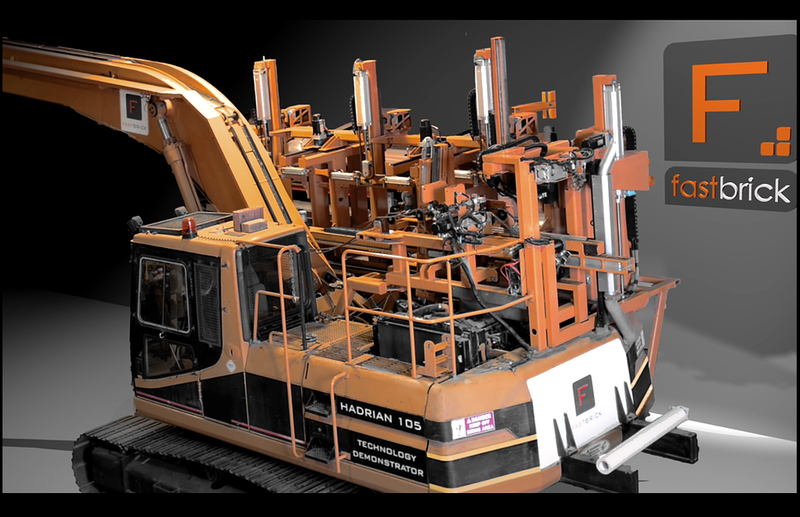 In this episode, Ron Vanderkley speaks with Mark Pivoc from FastBrick about Hadrian the bricklaying robot. Fastbrick is an Australian robotics firm aiming to disrupt the local bricklaying market with a machine it says will be able to build a four-bedroom house in two days, without any human interaction. A builder or architect will supply a 3D model, which is then converted into machine code that uses proprietary software to calculate the location of every brick in the building. Laser-scanning technology surveys the foundation once a concrete slab has been laid, and then loads and lays bricks using a 28m articulated telescopic boom. Adhesive is applied to the brick via the robotic laying head, and a laser alignment system ensures an accuracy of within half a millimeter. Mark Pivac is the primary inventor of Fastbrick’s automated bricklaying technology. He is an aeronautical and mechanical engineer with over 25 years of experience working on the development of high technology equipment ranging from lightweight aircraft to heavy off road equipment. Mark has 20 years of experience with pro/engineer 3D CAD Software. He also has high level mathematical experience including matrix mathematics, robot transformations and vector mathematics for machine motion. In addition, he has extensive design, commissioning and fault finding experience on servo controlled motion systems achieving very high dynamic performance. Ron Vanderkley: Welcome to Robots Podcast. Could you introduce yourself to our podcast listeners? Mark Pivoc: I’m Mark Pivac. I’m the Chief Technical Officer of FastBrick Robotics. We’re developing the world’s first fully automated end-to-end bricklaying robot. Ron Vanderkley: Why a bricklaying robot? Mark Pivoc: Well, people have been laying bricks for over 6,000 years and have been trying to automate the process and the intellectual property prior goes back to the times of the Industrial Revolution. The big issues at the moment for automation really are tackling anything that’s dull, dirty or dangerous. Bricklaying actually ticks all three of those. Although it’s not immediately dangerous, over a long period of time there’s a lot of repetitive strain injuries. It’s a job which in Australia is out in the sun, so there’s quite a high skin cancer risk. Any jobs which are dull and dirty and repetitive, and bricklaying certainly is, it’s very difficult to attract young people to take up the trade. The bricklaying organizations and the builders are having a lot of trouble training people. Even once they do attract a few people to start up the bricklaying apprenticeships, they have over a 50% dropout rate. Really, it’s a supply side driven issue in that there’s not enough bricklayers, particularly in Australia, but we also know that it’s throughout the world. In lower labor cost countries, there may be a pool of labor which is willing to do the bricklaying but they have issues with getting the appropriate skill and the training of those people to become bricklayers. Although bricklaying is a repetitive task, it’s actually quite a craftsman task because bricklayers don’t just put bricks down. A lot of the other work they do involves setting out the actual size of the house, making sure that it’s the right dimensions and square and that the windows and doors end up in the right place. It’s actually quite a skilled job. Although somebody can be trained up in an few days or weeks to become a productive bricklayer that’s just putting bricks down in a straight line or on a straight wall, it actually takes a full apprenticeship and years of training to really understand the intricacies of building an entire house from scratch from bricks to the modern standards. Of course, 6,000 years ago people didn’t really care, but these days there’s a whole bunch of different standards and requirements which vary depending on the location of the house, whether it’s in a cyclonic region and needs special roof tie-down straps put in or whether it’s close to a coastal environment and needs different mortar specification or in a bush fire area where the bricklaying needs to meet certain fire requirements or in commercial buildings, again, where you get certain fire requirements. Of course, the modern requirements for insulation and thermal performance of buildings is meaning that the bricklaying process is becoming more complicated, with bigger bricks, pre-insulated bricks, or insulation added between the bricks. You add up all these various complications, and it really is pretty much a no-brainer that bricks are going to be used into the future of building houses or commercial buildings. It really needs to become an automated process, and that’s why we’ve tackled it. Ron Vanderkley: Let’s talk about your product. Can get you to describe your robot to our listeners? Mark Pivoc: Our prototype robot is a 25 ton machine which can reach out 28 meters. The idea of it is you deliver the machine to site, you park it once at the building site, and then the boom is big enough to reach over the entire building site. If you would like to picture how this thing works in reality, the building site will be pre-prepared and the concrete slab laid, and then the bricks delivered to site. We turn up with our machine. A telehandler is used to load the bricks onto the machine. The machine can take three packs of bricks. There’s automated de-hacking robots which take a row of bricks off each pack and place them onto a shuttle, which then transports the bricks either to a saw or a router or a transfer robot, which then places them onto a chain conveyor where the bricks are gripped by little screw grippers. They are transported then out to a laying head, which is very a dynamic spherical geometry robot that has linear motors and direct drive top motors on it and also some harmonic drive motors. That laying head, the position is monitored in six degrees of freedom. Three linear XYZ coordinates and also the orientation by laser tracker and a smart track sensor. Those positions are read in a very high speed, some are in the order of 100 Hertz to 1,000 Hertz, into our CNC control system which calculates how much the boom has moved from where it actually should be — that could be due to slight mechanical inaccuracies, wind, or just the dynamic motion of it moving around. We know precisely to fractions of a millimeter and fractions of a degree how that end of the boom is positioned and orientated. We work out where the gripper should be and where it actually is and apply a little compensation there so that the robotic arm of the laying head plucks the bricks off the end of the boom and places them. Just prior to that, a layer of adhesive is applied to the bricks. We use adhesive for a number of reasons, as opposed to mortar. We have used mortar in the past and we can handle it, but there are a number of issues with mortar. The main one is that it has quite high thermal conductivity relative to the bricks. The modern construction methods are shifting towards a foaming adhesive, which is quite insulating and has less of a thermal bridging effect compared to mortar. We apply just a bed of adhesive, the horizontal joints of the brick. We don’t do the vertical joints because our initial targeting is for the render construction market. When you apply the render that goes into the vertical joints and it helps the render key on and also provides that bonding on the vertical, what’s called the vertical perp joints. We are in the long run aiming to lay face brick, but we do intend to do that with, again, either a thin bed mortar or an adhesive. The bed will finish on the edges of the bricks to give that jointed effect. We could use mortar, but the modern thermal requirements are moving away from that. Also, there’s quite a big cleanup involved. The adhesives we use don’t set until they’re exposed to either the oxygen or the moisture in the air. When they’re inside the machine there’s no cleanup problems in the pipes and so on, whereas mortar and thin bed mortars are a cement-based product, which is a hydration reaction. As soon as you mix it with the water they start to set. You’ve got a limited time frame, and then of course you have to clean it out. With up to 16 meters of hose on a machine, that becomes quite an issue in itself. Really, our whole approach has been to look at all the labor and time-consuming processes of either bricklaying or operating a machine and trying to design out those time-consuming and expensive human aspects from the machine. Ron Vanderkley: On a high level, what type of competition do you have? I’ve heard of robots like the one in the U.S., SAM. What sets your product apart? Mark Pivoc: Our main difference is that we handle the bricklaying process from end to end. From the moment the bricks are delivered to the building site through to the time of the finished house or structure, we’ve tackled it with an automated approach. Our competitors, like SAM in the U.S., they require manual feeding of the bricks to the robot quite close to where the bricks are being laid. In its current version, SAM can only build one wall at a time. It needs to be taught where the windows and doors are along that wall. It also needs a mason, a trained bricklaying person, to be there to help it out with certain things and do the setup. Our process is very automated right from the design phase. We take it through a SOLIDWORKS model and we’ve written special API interfaces to that to calculate all the bricks and cuts should happens. Even the generation of our g-code program is quite automated. We handle the bricks automatically from the moment they’re placed on the machine, which of course replacing packs of bricks being done by a forklift or a telehandler. From there right through to the laid brick it’s untouched by human hand. Ron Vanderkley: When we talked about describing your machine, you mentioned it didn’t have hydraulics. It’s just driven by electric motors and servo. Mark Pivoc: The entire machine is servo electric. Our first prototype has quite a lot of pneumatic components on it, but our next prototype is moving to be almost entirely electric. The only pneumatics on it really will be used for cleaning and contamination control. Ron Vanderkley: We talked about the software, and that you’re using a SOLIDWORKS model and you’re creating CNC code directly from that to drive it. Mark Pivoc: That’s been one of the major parts of our project, has been figuring out a good way to come up with the program for bricklaying. We’ve looked at a lot of different ways of doing it. Although it’s a similar process to 3D printing in that we build up layer by layer, we have to consider that each brick is finite volume and fixed size. Whereas with 3D printing, you’re dealing with something which is a lot more flexible in terms of it’s a much smaller voxel, or 3D pixel if you want to look at it that way. We’re building up a structure out of fairly big voxels, or 3D pixels, which are not cubic. They’re a rectangular prism. We have to deal with that, and we have to manage a lot of complication and issues to do with the way they’re cut. We can’t just cut off, say, a 10 millimeter thick sliver of brick. How do we handle that throughout the rest of the machine? It’s really, like most computer programming, you can bang out the basic guts of how the program works in maybe a day or two and then you spend the next five years perfecting it to handle all the intricacies and complications. Certainly, that’s been a big part of our process of development, has been dealing with all those intricacies, the cut bricks and corners and getting the bricks to mesh properly and figuring out practical ways or operators to be able to program this thing in a way that is faster than a bricklayer in building the actual house. Ron Vanderkley: What have been the biggest problems you’ve overcome? Mark Pivoc: The biggest problem for us has always been, until quite recently, the financial problem. We know that there’s a fantastic market out there. The annual bricklaying market worldwide is just absolutely massive. I got extremely interested in this project when we came up with the concept for an automated bricklaying machine. I really had no idea how many bricks were being used. All I knew what that bricklaying was in the news because there weren’t enough bricklayers available and the price of laying a brick had doubled in 12 months, which is usually an indication that there’s something going on in the market, either a lack of supply or a massive increase in demand. I jumped on the Bureau of Statistics website and saw that there are over 2 billion bricks a year being made in Australia. I figured that at a dollar a brick to lay them, it was a pretty good market and one worth tackling. We approached the design of the machine without too much concern about how much it would cost because we knew there was a good market at the endpoint. Like all things in automation, as your production numbers go up, the costs come down. We figured that we’d be able to get the costs under control later on. As you can appreciate, it’s a pretty massive automation task that covers a lot of different disciplines and is basically trying to build an entire production line or production plant on something that can be moved from site to site, operated outside in pretty much all sort of practical weather. From a technical point of view, most engineers know how to deal with those sorts of issues, but it’s getting the funding to sort that out. In Australia for a long time there’s been a reluctance to fund either manufacturing or technology based industries. We’ve had a very busy mining environment. As a consequence, the financial people have been more interested in mining. Unfortunately for Australia as a whole, but fortunately for the tech sector, there’s been a big downturn in mining and commodity prices and the financial capital markets are looking for technology and manufacturing and apps and all those sorts of things. It’s been a case of working at a slow rate for eight years to get the timing right so that it matches up with the financial markets. We’re well funded now, and now we can get in place a lot of technical solutions that just weren’t financially possible before and bring our product to market. Ron Vanderkley: What comes after this? Currently, you’ve got a prototype. You’re going to be going to production, is it next year? Mark Pivoc: We have a series of prototypes and production machines coming up. Our first prototype, which we call the 105, is really a technology demonstrator to prove that it’s possible. We know that there’s a number of things with that 105 machine which mean that it’s not likely to be used building houses on site. It would be suitable for some other application, such as a freeway sound wall and things like that, but it’s not ideally suited to the Australian residential market in its current form. We’re pretty well progressed on our next prototype, which we call the 109, and we see that as being the pre-production prototype, which we’ll start building early in 2016. Provided that one passes all of its tests and meets its expectations, then that will become the basis for our production machine. Ron Vanderkley: Is there anything else planned? We spoke about the possibility of rendering machines. Are there other attachments? Mark Pivoc: There’s a lot of different possibilities for large scale robotic construction and automation. The key technologies that we’ve developed are what we call course find positioning, so that we can approximately position over a very wide area and then measure very precisely that position and have a fine manipulator, which can then do quite precise work in a much smaller volume. Because it can be moved throughout a big volume, it means we can do tasks which would normally only be possible to automate in a factory with fixed robots. We can now tackle those tasks outside or in a much bigger area. There’s a whole range of different possibilities, ranging from riveting and automated fastening, automated welding, sandblasting, painting, all sorts of kinds of processes, rendering. If you can imagine that there’s a market big enough out there to justify the development costs, then really the world’s your oyster. 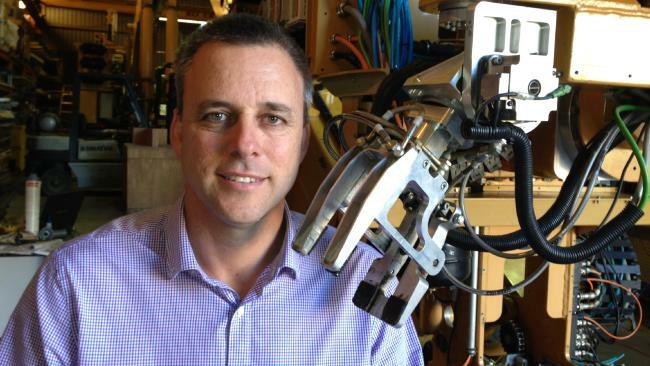 Ron Vanderkley: What are the job prospects in robotics in Australia? Are they getting better? Mark Pivoc: I’m probably the wrong person to talk to. I’m more of a cup is half full guy than cup is half empty. To give you an example, I’ve got three mechatronics graduates who’ve just finished their course. They’re now employed with us here. From our point of view, we think there’s fantastic employment prospects for bright young engineers. Australia as a whole I think has still got a way to go, but it’s pretty widely recognized that there’s not enough engineers around the place. Certainly at the moment in WA there’s probably a few more engineers than the market wants at the moment, but give it a year or two and that’ll probably change. A lot of that is WA is driven by the resources sector, and that follows through to the manufacturing sector. A lot of Australian manufacturing has disappeared over the last few years because of the high exchange rates, meaning that we’ve become fairly expensive in Australia. With the dollar sitting at about 72 cents as opposed to $1.10, we’ve just become 30% cheaper than we were a couple of years ago. I don’t know too many industries that can become 30% cheaper without doing anything. I think what’s probably a big issue for Australia is that we all understand it’s a global economy and we have to have a floating exchange rate, but floating to the degree that it does in Australia where in my working career I’ve seen the dollar as low as 52 cents and as high as $1.10. Any long-term planning for industries which have to have presence for 20 or 30 years to become efficient, car manufacturing, there’s such a massive amount of infrastructure, training and technology and associated first, second, third, fourth tier suppliers that feed that production line. You can’t just set up a car industry or a robotics automation industry overnight. It takes years to develop the technology and the expertise to do that. Probably in Australia one of our biggest issues is the fluctuating exchange rate. We’re going through the same thing now looking at where we’re going to produce these machines. The biggest factor of uncertainty in our production planning is what’s our exchange rate going to be in three years’ time? Nobody can crystal ball gaze that. Is it going to be 75 cents? Is it going to be $1.10? Is it going to be 52 cents? Is it going to be $2.00? Who knows? Which makes it extremely difficult to plan. Yeah, we’ve got some issues in Australia that we have to figure out some way to deal with. Ron Vanderkley: On behalf of the podcast, I’d like to thank you, Mark, for your time. We’d like to keep in touch and see where your product is going in the future. Thank you. Mark Pivoc: Thanks, Ron. It’s been a pleasure.